Superior Shooting Systems LLC is pleased to introduce its new 115-grain 6mm RBT (Rebated Boattail). This brand-new high-BC 6mm bullet is similar to previous DTAC bullets iwth respect to its overall form, but has incorporated a very important design change: it has a rebated boattail. During testing with an Oehler 88 at 1000 yards these bullets provided a measured G1 BC of .620!! 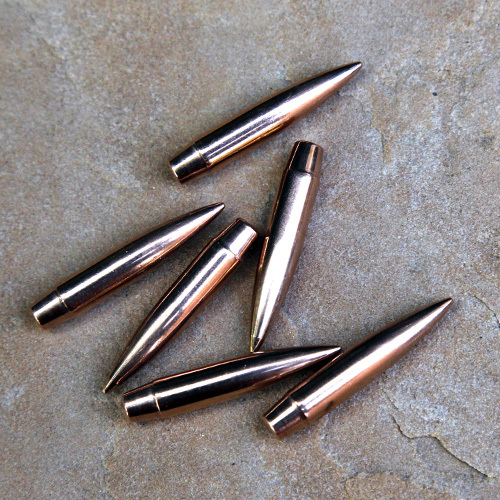 A rebated boattail bullet obturates (conforms) faster and more efficiently to the rifle bore. This results in quicker sealing and less gas blow-by. The result is a significant increase in accurate barrel life compared to diet of conventional boattails. Specifically, the RBT design slows down barrel throat erosion. This erosion results from the "flame-cutting" effect of burning propellant gases, which is intensified by a conventional boattail design. Along with extending the accurate life of a new barrel, this also means that our 115 RBT will perofrm better in a rifle that's already suffering from throat erosion. Fired from a 6XC cartridge, velocities easily surpass 3000 feet per second, and with low recoil.